Dashboard is a complex server technology and a frontend map application for aggregation and visualization of data in time and space. It receives and processes data through pre-defined aggregation functions on an ongoing basis. Data are presented in a map interface in form of visualization of aggregated data reports in space for the selected time period including history. Monitoring of technical and operation data. Source of data for management decision-making. Continuous collection of source data - ETL. Data are kept in safety within Dashboard technology. Online aggregation of data in time and space. Preparation of reports using aggregated data. Visualization in Dashboard web (or native) application. 3. What is the input information? Address (X,Y coordinates) and the monitored value. Technical equipment - e.g. mobile operator BTS (traffic data...). Branch (point of sales, transactions...). 4. What are the available forms of space aggregation? Standard administrative classification (cadastral territories, municipalities, districts, regions). User regions (sales regions, technical regions such as RF planning regions etc.). Areas defined in other way (hexagonal grid, Voronoi diagrams). 5. What are the available types of reports? Standard functions such as number, sum, average, minimum, maximum. Incorporation of statistical data (by population, area, incomes...). 6. Why Dashboard by Position? Demo application with the use of traffic data. The application makes use of Controls.js application framework. To visit the application click here: Position Dashboard demo. Dashboard demo works with information of traffic accidents, closures and road works (data from Czech national center JSDI). 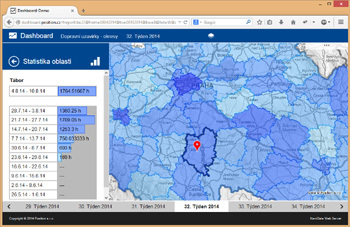 On-line aggregation is executed within the administrative structure of the Czech Republic (municipalities, districts, regions) and over the sample layer of hexagonal grid. Data layers may be viewed. Compatible with PCs, tablets and touchscreen mobile phones. Includes automatic GUI recognition for mobile and desktop/tablet version. Possibility of extension by a native mobile application. Operated from Position data centers. The solution may be completely incorporated into client´s infrastructure.